1. 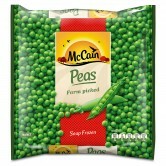 Place McCain Peas into a medium sized saucepan with rosemary, garlic powder and oregano. Cover with stock, bring to the boil, reduce to a simmer, cover and allow to cook for 5 minutes. Add the milk or cream and mint and cook for a further 2 minutes. 2. Meanwhile, heat a small pan over a medium-high heat, add the chorizo and dry-fry for 2-3 minutes or until browned and crispy. 3. 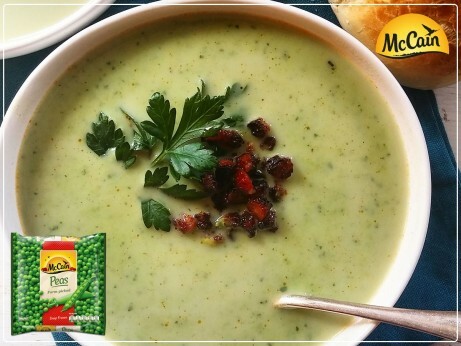 Blitz the pea mixture with a blender until the soup is the consistency you like. Season with salt and pepper to taste. 4. Divide evenly among bowls, top with the chorizo and fresh parsley. Serve immediately with fresh, crusty bread. 1 Place McCain Peas into a medium sized saucepan with rosemary, garlic powder and oregano. Cover with stock, bring to the boil, reduce to a simmer, cover and allow to cook for 5 minutes. Add the milk or cream and mint and cook for a further 2 minutes. 2 Meanwhile, heat a small pan over a medium-high heat, add the chorizo and dry-fry for 2-3 minutes or until browned and crispy. 3 Blitz the pea mixture with a blender until the soup is the consistency you like. Season with salt and pepper to taste. 4 Divide evenly among bowls, top with the chorizo and fresh parsley. Serve immediately with fresh, crusty bread.